Welcome to 4 Kingfisher Place, Waterview Heights! Our vendors have been fastidious in maintaining this property, and it’s kerbside appeal is just the very beginning of what is on offer here. The four bedroom home is immaculately presented; it’s the kind of property where you know if something has needed doing, it’s been done. Have a flick through the photos to appreciate just how neat this property is. Or better yet, come along and inspect for yourself. The home features a formal lounge room, along with an open-plan kitchen, living and dining area so you can enjoy socialising, entertaining, or watching your favourite TV show while you prepare meals at the brekky bar. The real icing on the cake here is how the dining room flows out onto the back patio, ideal for back yard BBQ’s – and your guests will just love the views over the lagoon and resident bird-life in the distance. There’s an ensuite and large built-in robe in the master bedroom, along with built-ins in the other three bedrooms. The home features a reverse-cycle air conditioner, along with a brand new electric hot water system. Oh and there’s a dishwasher in the kitchen, just to make life that little bit easier for you. The double car garage is complemented by a double carport, perfect for the horse float or caravan. 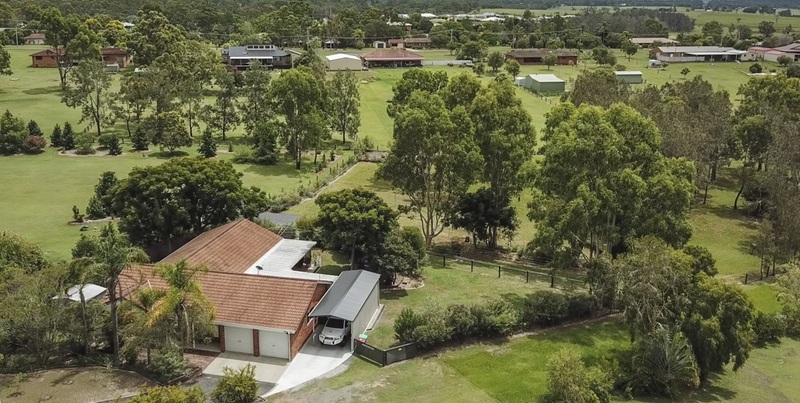 Speaking of horses, this property totals 7,336m2 (Approx 1.8 acres) and our vendors have enjoyed having their horse in the back paddock during their time here. The house yard is also fully dog-fenced, and there’s a large garden shed out the back, along with another beside the home. Town water is connected to taps in the house yard and back paddock, and there is also side access to the house yard, along with a side gate into the back paddock. 4 Kingfisher Place is located at the end of a culdesac, and our vendors have worked tirelessly planting myriads of native trees to add to the privacy of the property. This property is zoned R5 – large lot residential and there’s a whole bunch of features which we haven’t the space to list here – you really just need to come along and have a look for yourself! Our vendors are upsizing to larger acreage and are keen sellers – your urgency is encouraged. OPEN HOMES: Saturday 26th May, 9:00 till 9:30am. Wednesday 30th May, 5:00 till 5:30pm.